Taking the kiddos along for a hike on one of Marin's many fantastic trails is fun and rewarding. It can be a bit of a challenge though when they want to tackle the trail on their own but can't really go that far. Then there's the fact that toddlers and preschoolers don't always have the greatest of attention spans, which means that it's great to have something to see and do along the way. The Point Reyes park headquarters and visitor center near Olema is surrounded by numerous hiking trails that are perfect for a walk with little ones. Start with the easy paved Earthquake Trail, which tells the story of the 1906 San Francisco Earthquake and its effects on Point Reyes and crosses several little bridges. Take the short trail to Kule Loklo and explore a reconstructed Miwok Village, which often hosts ranger-guided tours and activities. You can also take a stroll down the Bear Valley Trail and explore the creek along the way and visit the horses up at the Morgan Horse Ranch. Find out more info here. This park along Paper Mill Creek offers a nice selection of easy trails, picnic areas, and a shady redwood forest. The Cross Marin Trail was once the route of the old North Pacific Coast Railroad, and kids can clamber down to the creek to explore and splash in the water. The creek is home to spawning salmon during the winter months, and you can watch them swimming upstream from several vantage points. 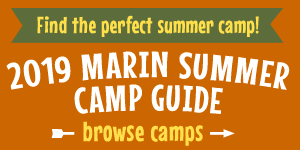 China Camp State Park, located in eastern San Rafael, is one of Marin's hidden gems. China Camp's Turtle Back Nature Trail circles a small hill next to San Pablo Bay and takes hikers through several different distinct ecosystems. Interpretive displays, some with tactile elements. It's designed to be accessible to wheelchairs, so it's a perfect place to bring along the stroller. You can also head over the beach and to play in the water and watch the kayakers paddle by. Make sure you take the time to explore the Chinese fishing village that gives the park its name. Improbably located on the grounds of the Las Gallinas Valley Sanitary District near McInnis Park in San Rafael, this complex of ponds surrounded by flat gravel trails is perfect for an easy hike. Be prepared to see a huge variety of birds, from pelicans and egrets to hawks and turkey vultures to black crowned night herons and ducks of all kinds. Don't forget to bring the binoculars! After your hike, you can swing by the snack bar at McInnis Park for a treat. Indian Valley Open Space Preserve, adjacent to College of Marin's Indian Valley Campus in Novato, is criss-crossed by trails and fire roads that are perfect for an easy hike. The tree-shaded trails are cool during the summer, and Pacheco Pond is a great place to look for aquatic critters like frogs, toads, salamanders, and newts. There's even a seasonal waterfall on the aptly-named Waterfall Trail. Bonus points for the organic farmstand near the sports fields that's open for grocery shopping on Saturdays from 10 am to 3 pm. Nestled at the foot of Mount Burdell just north of Novato, Olompali State Historic Park has plenty of flat trails that pass over creeks, by an old barn (home to a colony of bats) and farm buildings, and even to a reconstructed Miwok village and native California plant garden. The visitor center in the park's farmhouse has exhibits and a small gift shop, and the ruined Burdell Mansion was once home to the Grateful Dead and a hippie commune. The Tennessee Valley Trail is one of Marin's most popular spots for outdoor recreation, and a favorite with hikers, cyclists, and trail runners of all ages. This easy 3.4-mile out-and-back hike has its halfway point at Tennessee Cove, home to a beautiful beach that's a perfect place for a picnic or mid-hike break. It's manageable with an offroad jogging stroller, too. Go during the week or in the mornings to avoid weekend crowds in the parking area. Find out more here.